Legendary Icon, Nichelle Nichols celebrate her 85th birthday on Thursday, December 28, 2017. A favorite actress of fans worldwide, and a trailblazer for women to be considered for substantial positions in the aerospace industry through NASA, she also opened the doors for many women, as a whole, and especially women of color for acting roles of a significant position versus simply a housewife, maid or secretary. Ms. Nichols, who is a frequent guest at conventions and events across the globe, travels extensively and enjoys meeting the fans. Private, intimate birthday parties are usually the norm for Nichols, who decided to include 35 lucky fans in on the festivities this year to mark the milestone birthday. VIP packages which include dinner, birthday cake, and a champagne toast, plus a Meet & Greet, autographs, and photos with the birthday girl, are available to ultimate fans. 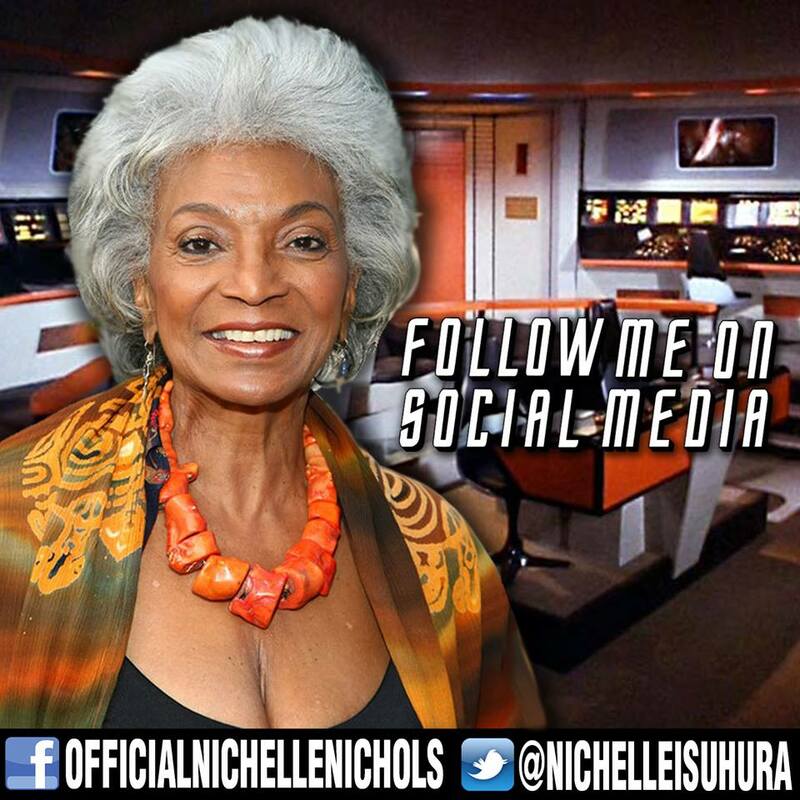 When Ms. Nichols was cast in the iconic hit television series Star Trek as Enterprise communications officer “Lt. Uhura,” she made history as one of the first black women featured in a major television series in a non-servant character role. Dr. Martin Luther King, Jr. put the history making achievement into his own words when he stated: “The first non-stereotypical role portrayed by a black woman in television history.” Nichols’ Uhura character went on to beat down stereotypes even more when she shared a kiss with Williams Shatner’s ‘Captain Kirk’ character in 1968. 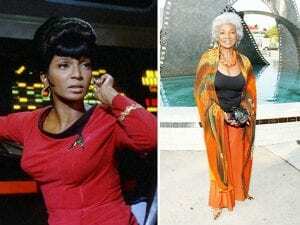 Nichelle in her days on Star Trek as Lt. Uhura, left, and Nichelle today. But even as a pre-teen, Nichelle was singing and dancing all over her hometown of Robbins, IL, where her father was both the town mayor and its chief magistrate. She was later discovered by Duke Ellington, who hired her to choreograph and perform a ballet for one of his musical suites. She finished the tour as his lead singer. She continued to work as an actress, singer, and dancer in a series of plays and musicals in Chicago, New York, and Los Angeles and toured with Lionel Hampton’s band in the U.S. and Europe. Always interested in space travel, Nichols flew aboard the C-141 Astronomy Observatory, which analyzed the atmospheres of Mars and Saturn, on an eight-hour, high-altitude mission. She was also special guest at the Jet Propulsion Lab in Pasadena on July 17, 1976 to view the Viking probe’s soft landing on Mars. Along with the other cast members from the original Star Trek, she attended the christening of the first space shuttle, Enterprise, at Cape Canaveral. As she has since the 1970s, she also spends much time recruiting minorities for NASA. Thanks to her popularity with Star Trek, Nichols also began volunteering her time with NASA, in a highly effective campaign to recruit minority and female personnel for the space agency. She served on the Board of Governors of the National Space Society. 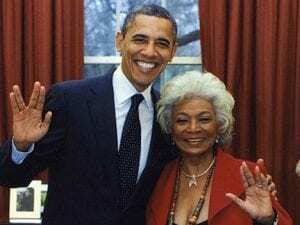 She has continued to appear in various television and film roles, returned to singing, and in 1994, she published her autobiography Beyond Uhura: Star Trek and Other Memories. She was awarded her much-deserved star on the Hollywood Walk of Fame in 1992. Today, at age 85, the still hard-working actress/singer continues to stay busy and active, as she will share from a recent chat. One of her favorite fitness past times is swimming several times a week in her own backyard swimming pool at her home in L.A. Here, Ms. Nichols chats with the Tribune just hours before her big Los Angeles birthday bash. TRIBUNE: What are some of your favorite memories of working on the original Star Trek TV show? MS. NICHOLS: I think my favorite experience was any time that my character, Uhura, got to get off the bridge and go down to the planet. She was the communications officer after all, and so I wanted to see the other side, meeting a whole new species for the first time. TRIBUNE: What are some of your best memories about working on the TV show? MS. NICHOLS: I really enjoyed the whole experience. I enjoyed going to work, I enjoyed finishing for the day and getting the heck out of there, but then I couldn’t wait til the next day to go back and do it all over again! TRIBUNE: Who would have thought that over four decades later, the original show would spawn all of these Star Trek films and other television shows. Do you have any personal favorite Star Trek movies over the last decades, or what? MS. NICHOLS: Well, I guess I liked very much to see a whole new audience brought to the Star Trek universe with these other films and TV shows. I also liked director JJ Abrams’ Star Trek movie (‘Star Trek the Future Begins’ 2009)…I’ve done the Comic Con events, and other Star Trek related events all the time. I have never experienced anything like Comic Con. Such a magical experience. TRIBUNE: Tell me about some of the work that you have done with NASA and the space program over the years. I understand that you’ve done some volunteer work over the years with the NASA space program. Is that true? MS. NICHOLS: Oh, the space program. Yeah. Well, my work with NASA helped include the first woman and minorities into the space program. That may be the legacy I’m most proud of. I just celebrated 30 years Mae Jemison’s historic first flight to space with her. That was a heartfelt moment. And I’m still involved with NASA, however, as much as I can, including – hold on to your hat – a recent view on NASA’s Sofia, it’s their stratospheric telescope. TRIBUNE: That’s amazing! What are some projects that you’re working on for the New Year? MS. NICHOLS: I’m currently producing a sci-fi parody film called ‘Unbelievable’ with 42 former Star Trek stars in it. I’m also producing a drama film called ‘Noah’s Room’. And I’m also working recording a new album. I’m up to my eyeballs in work but I’m really excited about both films…Both films and the album should be out sometime next year.